TOKYO Skytree is a broadcasting tower in Sumida, Tokyo. It is one of Tokyo’s most popular landmarks. TOKYO Skytree (634 m) is the world’s highest broadcasting tower and also the second tallest building on earth after Burj Khalifa in Dubai. The Skytree was finished in 2012 and is located near the traditional borough of Asakusa. The two observation decks offer a unique view of Tokyo and on very clear days you can see Mount Fuji. There is also a large shopping mall, called TOKYO Solamachi, with great food courts, a Planetarium, and an Aquarium. 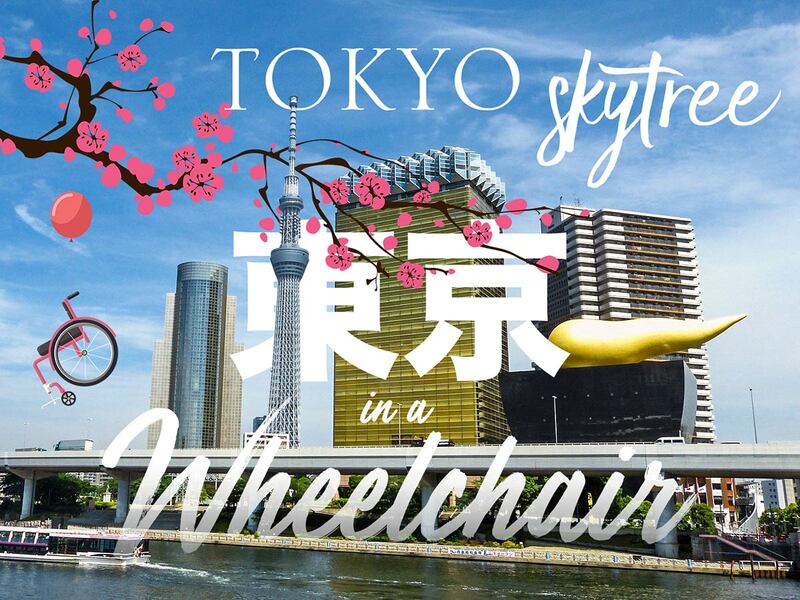 The TOKYO Skytree itself and its surroundings are perfectly wheelchair accessible with many accessible restrooms and elevators. Oshiage Station and Tokyo Skytree Station serve the TOKYO Skytree and the TOKYO Solamachi shopping complex. From Asakusa Station, you can either walk/roll to the Tokyo Skytree (1.4 km/20 min.) or you change for the Tobu Skytree Line which will take you directly to the TOKYO Skytree Station within some minutes. The entrance to Tokyo Skytree is on level 4F. Tokyo Skytree offers reduced entry fees for disability card holders (card must be written in English or Japanese). I paid 1.540 Yen (about 12 EUR/13 USD) to access both, the Tembo Deck (350 m) and the Tembo Galleria Deck (450 m) which is a great deal. The regular price for an adult for both decks is 3.090 Yen (25 EUR/26 USD). Here you can save 50 %! Scroll down to see the ticket fees for disabled people. There’s no need to book your tickets in advance as disabled visitors can skip all waiting lines. If you should encounter problems when asking for the reduced entry fee at the ticket counter, ask for the ticket sales manager! When I wanted to buy my ticket, the sales agent had no clue that there is a special rate for disabled visitors, although the special rate was displayed on the price chart right behind the sales desk. After buying the tickets, a guide will lead you to the elevator waiting area and you can skip the crowds. The TEMBO shuttle, Japan’s fastest elevator, takes you up to the 3-level Tembo Deck within 50 seconds. From the Tembo Deck upper floor (F350) you have a very nice all-round view of Tokyo. On the middle floor (F345) you find the SKYTREE Shop and the Sky Restaurant 634. The glass floor on the lowest level (F340) might give you some extra-thrills. It also accommodates the SKYTREE Café. Of course, you can also find wheelchair accessible restrooms on all three floors. The Tembo Deck can get very crowded, so make sure to come either early in the day or at least 1.5 hours before sunset. If you want an even more spectacular view with fewer people, I can highly recommend going up to the Tembo Galleria Deck on 450 m. You can buy your tickets at the counter on F350. When the elevator opens on floor 445 and you take a first glimpse of the view you’ll surely say “WOW!”. Spectacular. Amazing. The glass structure gives you the impression to walk out in the sky. The sloped circuit leads you up to the highest point of 451.2 m (Sorakara Point) and finally back to the TEMBO shuttle which will bring you back down to F345. There is also a wheelchair accessible toilet, it could the highest accessible toilet in the world! We went up to the Tembo Galleria to watch the sunset. It was amazing to see the contours of Mount Fuji as the sun was going down! Watching the sky turning red made me forget everything around me. Personally, I think that paying the extra fee for Tembo Galleria Deck is totally worth the money! You can stay as long as you wish and enjoy the beautiful bird’s-eye-perspective of Tokyo. After our visit, we went to the TOKYO Solamachi food court and had a very good dinner. I visited the TOKYO Skytree in October 2016 with my mobility scooter and spent a nice day there. TOKYO Skytree is one of the most impressive sights of Tokyo and definitely a must-see. The wheelchair accessibility is just ideal! What do you think of TOKYO Skytree? Are you planning to visit while in Tokyo? Leave a comment below or send a message to share your travel experience. Explications très utiles et très claires pour les personnes en fauteuils roulant , leur enlevant leurs éventuelles appréhensions en leur montrant la simplicité pour cette visite avec les bons tuyaux. Les photos sont époustouflantes ! Ce doit être une expérience hors du commun avec sensations de OUF! Merci Miss Little Turtle pour ce joli partage.